In the fall of 2018 UNU-WIDER welcomed 11 doctoral students from around the world as part of our PhD Fellowship Programme. 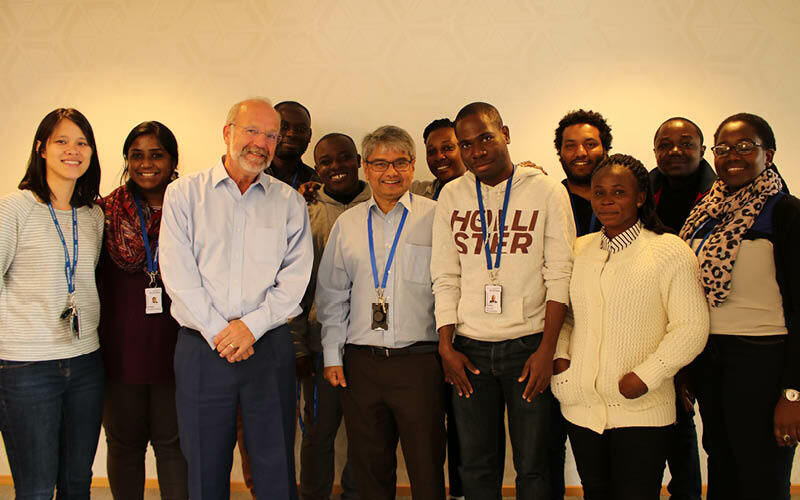 The students, from Ghana, India, Malaysia, Mexico, Ethiopia, Togo and Kenya, came to UNU-WIDER for three months to work on their research under the guidance of a UNU-WIDER researcher as their mentor. 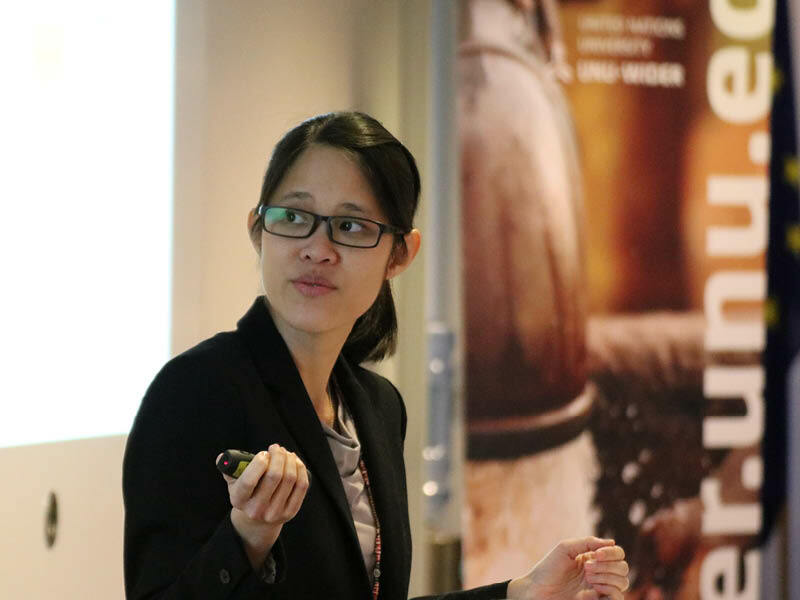 In this blog Pui Yi Wong, a PhD candidate at the University of Malaya, talks about her research and her experience as a PhD Fellow at UNU-WIDER. My research is focused on the commercial development of ikat textile-weaving in Sarawak, Malaysia. Ikat means ‘to tie’ in the Malay/Indonesian language and refers to a resist dyeing method used to create designs on yarns before they are woven into a textile. Not many people in Malaysia have heard of ikat or ‘pua kumbu’. Instead the national narrative on handmade textiles has focused on the Malay batik and songket, with much less attention on ethnic textiles. But ikat is an important material culture of the Iban people, the largest ethnic group in the state of Sarawak on Borneo island; their ancestors have been weaving ikat textiles as garments and for ritualistic use for centuries. One of the most significant Iban textiles is the ‘pua kumbu’, a large ceremonial blanket used in weddings, births, harvests, and most intriguingly in headhunting rituals of the past. The designs on the ‘pua kumbu’ are believed to have come from dreams and features the cosmology of ancient Iban beliefs. The dyeing and weaving processes are shrouded in mystic and taboo. But now ikat weaving appears to be dying out, despite decades of effort from various actors to develop the cottage industry, not just for the purpose of heritage preservation but also for poverty alleviation and social development among rural Iban communities. The goal of my research is to find out why this is happening despite significant efforts and incentives. I trace the key actors along the value chains and examine the different roles that state, market and societal actors play. Deciding to pursue this PhD wasn’t an easy decision. I have undertaken all my education in Malaysia, and I deliberated for a long time before doing the same for my PhD, aware that the resources available to researchers in Malaysia are lacking. But I was compelled by the lure of the research topic. I love that, aside from tackling a fascinating area of indigenous craft, my research allows me to analyse the debates on states versus markets and delve into what actually happens on the ground in rural areas. A keen interest of mine is the search for ideal development models in political and development economics. So, I proceeded, taking on the challenge of the PhD, holding out hope that maybe I would be able to find an opportunity to gain experience abroad during my PhD. When I saw the notice about the UNU-WIDER Fellowship Programme I knew I had to apply, although I wasn’t very hopeful as I understood that UNU-WIDER focused more on quantitative research. Imagine my delight when I was offered a place! I jumped at the chance to be part of a research institution at the forefront of development economics research. From the very first day I walked through the corridors at UNU-WIDER, what struck me was how professionally the PhD fellows were treated. Coming from a developing country where academic research is undervalued, it was refreshing to have people take interest in my work. I was also impressed with UNU-WIDER’s progressiveness. I soon learnt that not only did they accept my heterodox and qualitative research project, they had many of their own, employing varying methodologies and datasets. My time at UNU-WIDER provided me with so much: the generosity and kindness of the researchers in sharing their time and advice; the helpful and welcoming nature of all our UNU-WIDER colleagues; the well-equipped and well-resourced environment for us to work. I received valuable feedback and made great progress in my research under the guidance of my mentor, Rachel Gisselquist. And being part of the Think Development – Think WIDER conference gave me the opportunity to see award-winning economists argue the future of development economics, and to network with researchers from around the world. It also helped me solidify where I see my research taking me. Pursuing a PhD is a lonely journey, but after meeting researchers with such diverse backgrounds and research interests, I am now more confident about taking my next steps. Perhaps one day I’ll even find my way back to UNU-WIDER and stay for a little longer. Also, on a personal note, I gained memories I will treasure always and friends that I am sure I will stay in touch with. The weekends (when I wasn’t working on my thesis) were spent exploring Helsinki or boating over to Tallinn and Stockholm with the other PhD Fellows, and I even got to Lapland, met Santa and hiked solo in snow for the first time — incredible! So, for people considering applying for the fellowship programme, all I can say is, do it. Finland is a beautiful and charming, sauna-crazy country and I’m glad to have had the opportunity to go there, and meet amazing people with whom I could work hard and play hard. I am very grateful for the exceptional experience that the UNU-WIDER PhD Fellowship Programme has given me.